Our mission is to become an organization of excellence in professionalism, musicianship, creativity and respect for all musicians in Country Music. We will promote and educate the market about Blacks in Country Music and their contributions to the genre. Since 1989, several blacks have made waves in Country Music, including Dr. Cleve Francis, Mary Ann Palmer, Rissi Palmer, Frankie Staton, Tammy Dee, and the latest Darius Rucker, formerly of Hootie and the Blowfish. "Palmer Sings Heart and Soul Country"
There is something excitingly different about Mary Ann Palmer: she's talented and determined to set the country music world on fire. Music lovers around the world experienced Mary Ann's mesmerizing persona and "Heart and Soul Country" charm on The Nashville Network's `Be a Star Showcase' this past January. The internationally acclaimed program exposed the new country music duality of Palmer and learned what the Prairie View Family already knew . . . that Mary Ann is star material! Additionally, Palmer's dynamic performance on the Houston's Livestock and Rodeo Show along with Gladys Knight and Frankie Beverly and Maze this February, added a new dimension to musical entertainment. 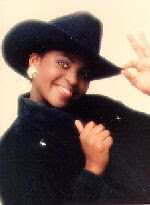 Affectionately crowned the `Princess of Country Music,' Palmer first appeared on national television when she won the Miss Collegiate African American title in 1990. In 1991, the public again got a taste of her country soul style during her appearance on Star Search, and CBS's Souls of American Music. Mary Ann, who grew up in Belleville, Texas is one of a few African Americans who aims to put some color in country. Deford Bailey of Bellwood, Tennessee opened the door in the forties when he played on the Grand Old Opry and became one of its most popular performers. Since Bailey, country music has sporadically added the sounds of O. B. McClinton, Henry Glover, Big Al Downing, Stoney Edwards, Charley Pride, Otis Williams of the Charms, and Ray Charles, to name a few. African American females who also gave the music a shot in the arm include Etta James, Linda Martel, and Nisha Jackson. The Pointer Sisters also won a Grammy for their "Lover with a Slow Hand" release, and Lionel Richie for composing and producing 'Lady' for Kenny Rogers. Currently, Cleve Francis, cardiologist turned country crooner is the only African American with a major label. Despite these entries on the scene, Pride has been the most recognizable and successful to date. The mainstream acceptance of Country music and Palmer's international media exposure, could only help to open the flood gates for African-American singers. For instance in Texas alone we have Mary Cutrefello, C. J. Edwards (Stoney's niece), Tammy Dee, Linda Francois and Donna B, to name a few. Of course, our African American men won’t be denied either. We have Al White and Larry Callies who have been around for some years now and are making a name for themselves too. With these artist on the horizon, it is only a matter of time before the genre will feel the impact of this diverse talent. The competition is fierce, but Mary Ann is destined to make a difference this time with a Mo' Betta Country Soul style on her second album "Mary Ann," released by UNITAN. Her first album "Lookin' At Me" carved a niche for her. However, her vision for success is more evident on "Mary Ann." Palmer emerges with a "new brand o' country," while maintaining the signature Country & Western backdrop. The difference is her blend of musical idioms, culled from Rhythm & Blues, and gospel, to create her unique soul style. The vocal dynamics clearly embodies her Country Soul style with its cross-cultural and generational appeal. There is a full down-home country on the album from `They Don't Make Love Like They Used to' to an Africentric Country‑R&B in `Doing Lonely Time'. "Palmer gives you a taste of what real country music is like," says Rene John Sandy of Class Magazine. If similarities must be made, she's the best of both worlds--African American and Country. She is a perfect symbol of the new country music duality and a true expression of her cultural heritage. Palmer's mesmerizing persona simply makes the connection between voice and touch. Johnny High (Country Revue) describes her as "one of the best female vocalists alive today." Mary Ann provokes thought with rhyme and reason. Her "heart and soul country" exposes the closet country listener and converts those who usually say, "I didn't like country music, but I enjoy your singing!" These qualities make her an exceptional artist in a genre, virtually void of African Americans. Mary Ann's early influence for Country music came at age three and later fueled by Charley Pride around age ten. Palmer also admires Dolly Parton, Reba McEntire, Willie Nelson, Shirley Caesar and K. T. Oslin whose songs are staple in her repertoire. When ask, "why country music, there are no Blacks in it?" She quickly responds, "Why not country? Country is a rebirth of the blues. It is about living and the human spirit, and I'm only expressing my cultural roots in the music. Further, if Charley Pride can, so can I." Mary Ann is that kind of woman who was born to sing country. As Billie Holiday use to say, "No two people on earth are alike, and it has to be that way in music or it isn't music." Palmer's conviction is true to her inspiration. Mary Ann holds true as an artist of destiny. She wants to be to Country what Marion Anderson was to Opera - the most recognized African American female in a nontraditional genre. She wants to receive the Grammy as Country Artist of the Year. Palmer is the former Miss Prairie View A&M University and received her Theater Arts Degree from Prairie View A&M in 1991. She also received the Sammy Award as Texas' Country Artist of 1992. She has appeared with Charley Pride, Dionne Warwicke, Danny Glover, Harry Belafonte', Barry White, The O'Jays and Sinbad, and the H. B. Barnum Orchestra, to name a few. Country music will not be the same with Palmer on the scene with her Mo' Betta "Country Soul" sound that is magically hers in "Mary Ann." This album is a perfect symbol of the new country music duality Palmer hopes that major record labels and fans alike will flock. Meanwhile, Palmer is enthusiastically preparing for a major Houston pre-Rodeo "Color Me Country Concert" set for early February 2003. The concert, hosted by the Black Country Music Association, will feature several African American Country Artists who are steadily making an impact on the music scene. Great article but as we can see blacks are still having a heck of a time being showcased, even on programs like the 'CMA'S' which they refuse to give them airtime for on 'live' t.v. Rissi Palmer came close but still wasn't 'promoted' good enough for me. Also, with early morning shows like:'Good Morning America', 'Today', and a few others they don't seem the slightest bit interested in presenting these black country music singers either. They kiss up to the white ones, but the black ones aren't even mentioned. I hope and pray that that glass ceiling breaks all to pieces real soon. Hope you will be as excited as we are at our pulsebeat.tv (from the WCHB 1200Am/99.9Fm's “Inside Detroit with Mildred Gaddis” Greg Dunmore Hot Happenings segment) rare spotlight of Black female Country and Western singers!!! Our show is a Detroit first (and maybe, even a first for anybody anywhere), to bring attention to the overlooked artistic contributions of black women country vocalists. As always, we thank you for giving us a few moments of your time as we say “Bravo” to the artistry of some remarkable music makers! In recent times, Country Music, an American music born out of the Blues, has enjoyed mainstream acceptance. However, representation in country music is void of the contributions and participation of Blacks to the genre. While Deford Bailey, Charley Pride, and Ray Charles though not classed as country, enjoyed some acceptance, the doors of country music remain shut to other performers and musicians. In our efforts to enhance the participation and acceptance of Blacks in Country Music, in January 1989, the Black Country Music Association ™(BCMA) was formed in Texas. BCMA is committed to increasing the number of performers in Country music, through talent showcases, educational seminars and aggressive marketing. We will provide the necessary tools for artists to pursue his or her individuality. Our mission is to become an organization of excellence in leadership, professionalism, creativity and contributions of all musicians in Country Music. Our goal is to recognize and promote the heritage, and contributions of Blacks in Country music. We will continue the spirit of community and respect all musicians, create opportunities for artists to gain entry into mainstream Country.